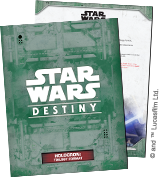 The latest versions of the Star Wars™: Destiny Holocrons are now online! This update includes errata to a couple cards that players should be sure they read about. 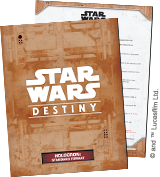 You can learn why these changes were made in the updated Star Wars: Destiny Rules Reference, also updated today. Before you do, download the new Holocrons to see the changes for yourself! Click on the images above to see each new Holocron. This update goes into effect 4/11/2017.